Domestic staff Agency "Little Prince" has firmly established itself in the market for recruitment of home staff in St. Petersburg and Leningrad region. For many years our Agency has been helping to find good well, experienced and responsive babysitter, governess and neat and polite housekeeper. 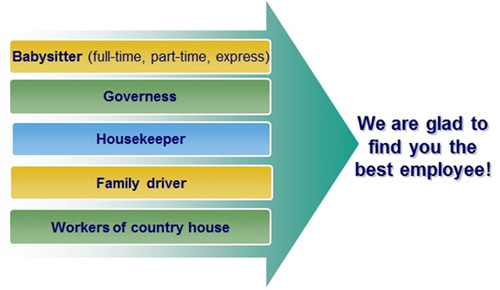 We can also suggest cook, family driver, workers of country house, nurse. We provide one-time cleaning of the apartment or country house. Our agency’s staff speak English and they will be able to help those foreigners living in Russia. Our goal is to find the most suitable to each other people. We strive to provide customers the right person of domestic staff they need quickly, and to provide the best employees an opportunity to find a great job. Our agency’s staff consist of professional psychologists, honest, attentive, friendly and creative people who are trying to help our customers. Our work is based on their knowledge and experience. Basic principles of our Agency’s work are cooperation, individual approach to client’s needs, taking into account applicant’s characteristics. We respect our customers and employees and that is why we honestly and openly interact with them. We are predictable, we have a flexible pricing policy, we respond to people's needs quickly! We have a unique technology to work. We are in progress every time, and help our clients and candidates to proceed. We bring the benefits to people and do a good deed. 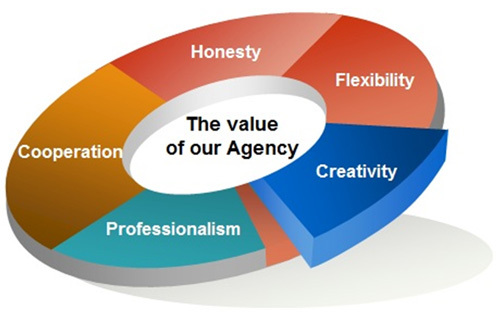 The value of our Agency: Honesty. Professionalism. Cooperation. Flexibility. Creativity. To find quickly the optimal solution for the both parties. Be open to everything new. To learn from experience, to learn from the best. Treat people the way we would like them to treat us. The cost of services of the Agency " Little Prince"
Our manager identifies your (clients) demands towards future employee, their duties and conditions of work. Our manager sends Cover Letter of employees to your email or tells about the applicants by cell phone. Our manager organizes the meeting between you and the employee(s) you have chosen by the CV in our office or in some other comfortable for you place. You make some testing days to try the employee(s) you have chosen after the meeting. After testing days you make a decision to take the employee or to try another one. 3 ways of paying for our services after you make a decision about an employee. 1 year agreement with 4 warranty replacement is 100% of the employee's monthly salary, but not the less than 23 000 rub. 6 months agreement with 2 warranty replacement is 50% of the employee's monthly salary, but not the less than 18 000 rub. 1 month agreement with 1 warranty replacement is 15 000 rub. You can choose one of these options. You are to pay only once.